If you don’t want to be lazy like me, then you can make your own beef patties using ground beef. Just make sure the size of your raw patties is slightly larger than your buns. The patties will shrink a bit as they cook. Grilling is the best way to make burger patties, but cooking them in a cast iron or non-stick pan over medium heat for 4 minutes on each side works as well. Unlike steak, ground beef should be cooked thoroughly to kill any harmful bacteria that might be in the center of the patties. The total cost to make this kind of burger at home should cost around $4 to $6 depending on how big you make it. For reference, McDonald’s restaurants use 45 gram hamburger patties for their Big Macs. The patties I bought from Superstore seen in the image above were 130 grams each, at a cost of $1.50 each. 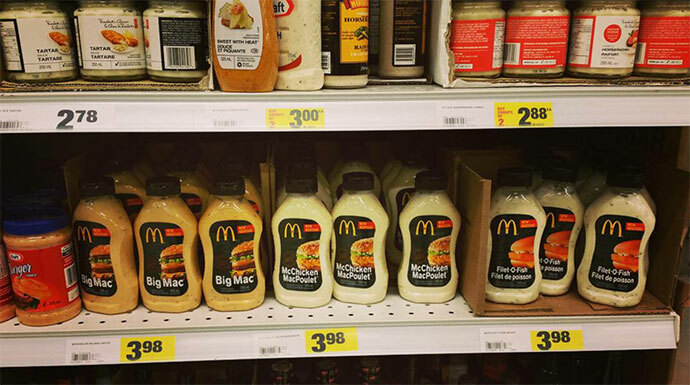 If you do not have access to the Big Mac sauce, you can substitute with Thousand Island dressing, which tastes very similar. If Google was a person it would be part of the millennial generation. I don’t see the appeal myself. I crave mcdicks once a year or two but it isn’t a “good” burger. get some ground beef and spice that up with some hot mustard, garlic, worchestershir, cayenne, salt & pepper…. I would not pay $20 for an approximation of a McDonald’s burger haha. But I’m sure there are people with too much money who would order that. First you guys get “All Dressed” Chips and now this? I know a few weeks back they did a give away of Big Mac sauces here in the US, and those things were going for a decent amount of money on eBay… I wonder if you could make any money selling this to suckers south of the border. and ppl actually bought it at $43 US!!!! I was going to say, it’s usually more affordable to form your own hamburger patties instead of buying the pre-bought ones. I’d also suggest making your own Big Mac sauce if you can! Pinterest has tons of copycat recipes. home made fresh always, never frozen patties with the additives which is just as bad as a McD. IN my part of the world here in the GTA of Southern Ontario lean ground beef can be bought for $2.99/lb. 1/4 patty ($0.75) + fresh bun ($0.50) + toppings ($0.25) $1.50 for the freshest home made 1/4lb burger. No waste, no need to drive to a hamburger take out & no disposable paper or cardboard. Add fresh cheese from the block not the processed crap. Same with home made Pasta, Pizza or whatever. Take out food places, restaurants & diners are in the business to make money from folks that have money to throw away. If you want home cooked food, then eat at home. That looks pretty good for a Big Mac imitation! Cost and time wise is not really worth it. I think it’s too much work. Besides you can use their BOGO coupon to lower your Big Mac cost for your cravings! That’s a good point. Those coupon deals are really worth it. I was a little bit tempted to buy the fish sauce (really it’s just mayo) to put on my vegetarian fish!